While cars were being loaded with laundry and bodies that were coming home, another group of students were lining up to enter the Black Box Theatre (BBT). 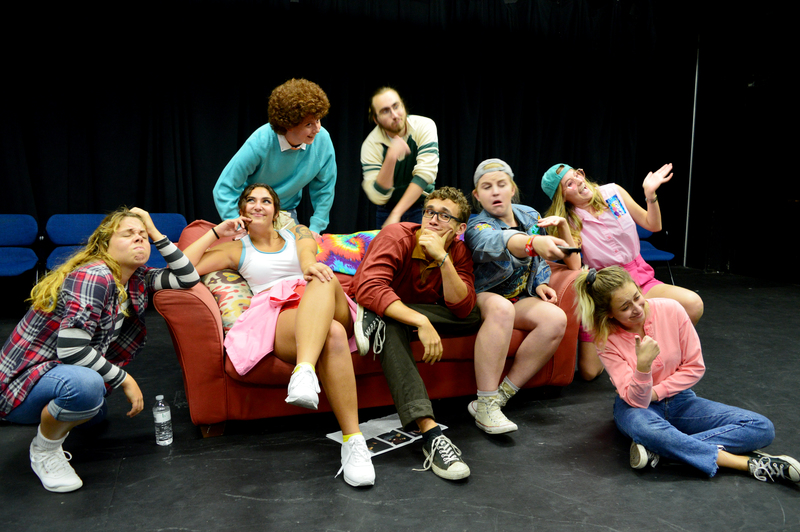 Once chairs were full, students piled onto the floor, waiting in anticipation for the Comedy Friends to arrive. A remix of The Fresh Prince of Bel-Air theme song played as the Comedy Friends ran across the stage. 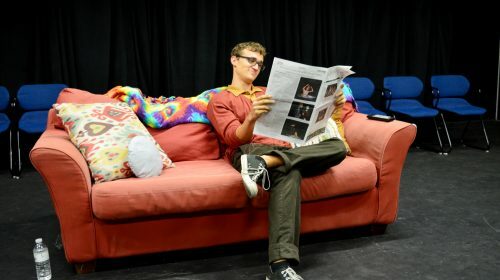 Thesis student James VonHollen remained on the red couch, which would stay as the permanent fixture on the stage for the remainder of the show, leafing through an issue of the Catalyst as his prop. Prior to the show, attendants were asked to write random phrases or punch lines on scraps of paper. These scraps of paper were then picked at random from the improv group and then became the catchphrase of the characters once they entered a scene. 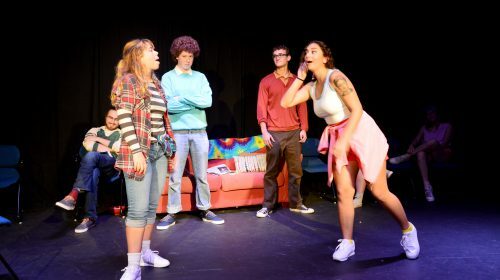 At the beginning of each new improv game, the audience was polled on what the setting or characters should be. 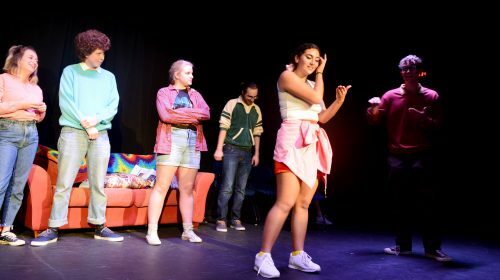 “The Dad Game” had VonHollen, third-year Alba Abrams and first-year LilyAnne Rodriguez cast as a father with his two children. Three storylines were decided by the audience and, with each change, the characters switched roles. Abrams was the muggle father watching his two children go off to Hogwarts, VonHollen was a former bullied kid attending his high school reunion where he planned on parading his children as “Nat Sci geniuses,” while Rodriguez was at the DMV for one of many traffic violations–they had been waiting there for years. “Good Cop, Bad Cop” had first-year Charlie Leavengood and thesis student Austin Venhaus as cops, while first-year Robert Lawlor played a criminal. Lawlor left the room while Leavengood and Venhaus discussed what Lawler’s story should be with the audience. Lawlor then had to figure out what he was being interrogated for: he had murdered the inner child of an attendant in the audience while using sulfuric acid on the ice planet of Hoth. Thesis student Austin Venhous played a party host who was tasked with figuring out who the attendants were. The audience had chosen to have Lutzi play Shrek, second-year Olivia Siegel as one (or any) of the Teenage Mutant Ninja Turtles (TMNT) and Rodriguez as a retail sales employee. The improv group positioned chairs in a circle, as each took a seat. A “doobie,” in the form of a used lollipop stick, was passed around as each Comedy Friend picked a random word, including “Publix sandwich” and “cucumber.” These were then used for the final skit of the show where an anxious customer ordered a Pub Sub from an impatient Publix employee and the corporate office of Publix discontinued every ingredient except for Honey Mustard and olives. The ‘Sitcom’-edy Friends show lasted for an hour and 45 minutes. Upon its completion, audience members jumped to the stage to congratulate their friends. 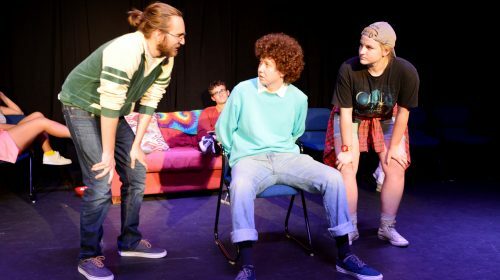 Although not intended, the show had been scheduled on Tuesday, Nov. 21 at 9 p.m., the day prior to when many students were leaving for Thanksgiving Break. The show was also scheduled the same day that the latest edition of Nimbus, the alumni publication from the Office of Communications and Marketing, had come out. 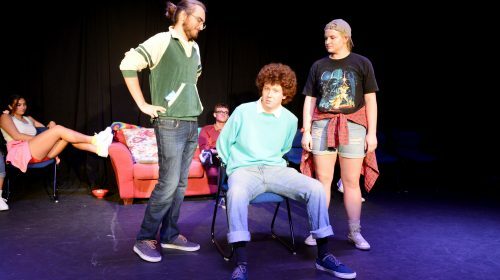 On Nimbus’s front page was the Comedy Friends improv of last year, celebrating winning the title of fourth best college improv group in the nation.